1. Lightly grease and 8”x 8” baking dish and set aside. 2. Place butter in a large pot and melt over medium heat. Once butter has fully melted, stir in marshmallows and continue to stir until marshmallows have melted. Remove from heat and add cereal. 3. Mix together until well blended and no dry spots remain. Fold in mix-in ingredients and pour into the prepared baking dish. 4. Smooth the surface of the cereal mixture and allow treats to set, about 1 hour. 5. Cut out 9 even squares and serve. 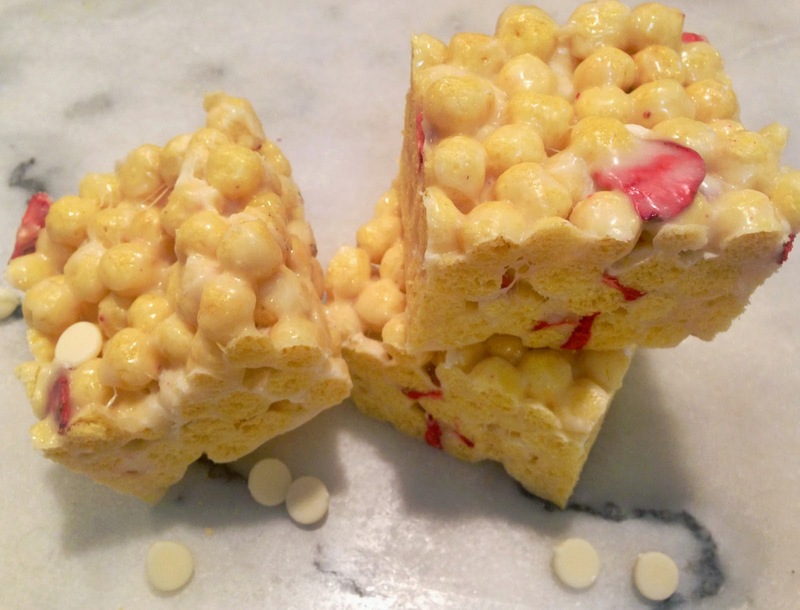 I used Kix cereal and 1/2 cup freeze dried strawberries, 1/2 cup white chocolate chips.